Uncirculated (UNC) - Every coin starts its life as uncirculated when it is struck at the mint and it remains in uncirculated condition until it enters the commerce stream or is otherwise damaged. In order to be considered UNC, a coin must not exhibit any wear suggesting it has ever been in circulation. Coins with weak strikes, where details are not fulling struck, are still considered UNC. Brilliant Uncirculated (BU) - BU coins are coins with absolutely no wear on them. In addition, these coins are bright with original mint luster. There can be minor bag and contact marks exhibited but no major detracting marks. Gem Brilliant Uncirculated (GEM BU) - GEM BU is the coin grade assigned to a coin where the strike is sharp and the details of the coin have no evidence of wear. The mint luster must be stunning with very few bag or contact marks. Proof - Proof coins are made using a special mint process where the dies are polished and the coin is struck multiple times. This process produces a coin with a mirror-like finish. Cameo - Coins classified as Cameo are generally mint issued proof coins where the raised details look whiter or frostier than the fields. Deep Cameo (DCam) - DCAM refers to a proof cameo coins with raised details that are deep white and the fields are high polished and appear almost black. DCAM Proof coins are highly sought after, especially when the coin is from before the 1970s. 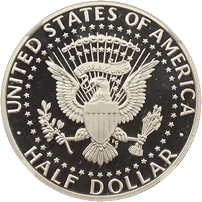 Since the 1980s, the minting process has improved to a point where most coins manufactured usually exhibit Deep Cameo proof strikes. 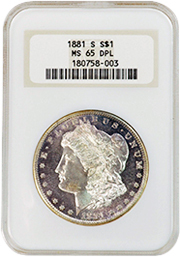 Better Grade - A 'Grade' or condition that is considered above average for that particular coin, date, or variety as compared to commonly seen average circulated coins. High Grade - The term 'High Grade' can vary from coin to coin depending on the particular coin's known population. It is used to describe coins that are within the top 50% of their condition relative to the known population. Choice - A desirable example of the particular coin or a high grade for that mintage. Usually displaying a higher than average amount of luster. Toned - A chemical reaction whereby the metal has discoloration to the service of the coin. Toning can either be a detractor (making a coin less valuable) or add value to the coin (very attractive beautiful toning). Toning does not affect the overall grade of the coin. Cleaned - A coin that is referred to as 'cleaned' has been improperly cleaned in such a way that it has damaged the surface or appearance of the coin. There are many methods of 'improperly cleaning' coins including, polishing, thumbing, brushing, wiping or otherwise wiping the surfaces in an abrasive manner. '+' (Plus) - A '+' (Plus) - this designates that a coin is a coin at the high end of their assigned grade, approaching the qualifying requirements for the next grade. 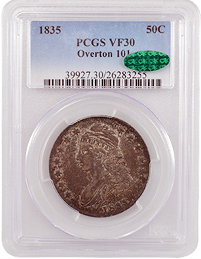 In addition to their superior technical merit, coins that receive a Plus Designation must have above-average eye appeal. Graded/Slabbed Coins - A graded or 'slabbed' coin is a coin that has been evaluated by a third-party grading service and then encapsulated in a type of holder that is specifically designed to protect the coin from environmental damages and cannot be removed without damaging the holder. Top Tier Grading Services - The most respected industry accepted grading services generally reference NGC and PCGS. Both services are respected by the industry because of the consistency and accuracy of their grades as well as maintaining population reports that make it possible to determine how many other coins have been graded of a particular date and condition. 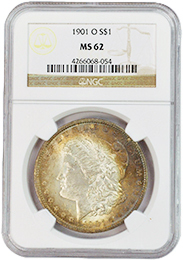 NGC - Numismatic Guaranty Corporation is headquartered in Sarasota, Florida and is considered to be one of the industry's most reputable third-party grading services. 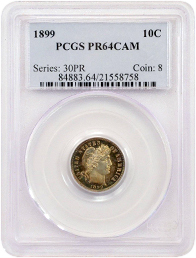 PCGS - Professional Coin Grading Service is headquartered in Newport Beach, California and is considered one of the industry's most reputable third-party grading services. CAC - Certified Acceptance Corporation or CAC is a firm that evaluates certain U.S. coins already certified by Numismatic Guaranty Corporation (NGC) or Professional Coin Grading Service (PCGS). Coins which CAC deems high-end for their grades receive green stickers. Coins which are at least high end for the next grade up are bestowed gold stickers, which on average increase values up to 90% or more of PCGS/NGC coins already graded the next highest grade. 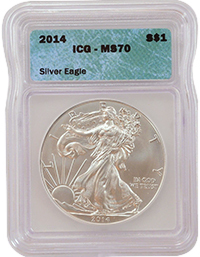 ICG - Independent Coin Graders is a grading service located in Tampa, Florida. 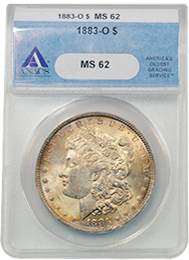 ANACS - American Numismatic Association Certification Service is America's oldest grading service and is located in Englewood, California. Other - There are many other grading services in existence of varying reputation. With any of these other less recognized grading services, it is suggested the customer we grade the coin based on the appearance and do not assume the assigned grade to be accurate. Full Date - Mostly used in reference to Standing Liberty Quarters and/or Buffalo Nickels where the design of the coin leaves the date exposed to excessive wear. Full date coins have the date completely visible with little signs of wear. 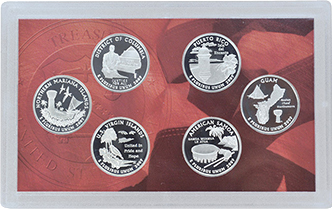 Partial or Part Date - Mostly used in reference to Standing Liberty Quarters and/or Buffalo Nickels where the design of the coin leaves the date exposed to excessive wear. Partial or part date coins have wear in the area of the date, but generally have at least 2 digits still discernable. No Date - Mostly used in reference to Standing Liberty Quarters and/or Buffalo Nickels where the design of the coin leaves the date exposed to excessive wear. No date coins have the date completely worn off due to heavy wear. 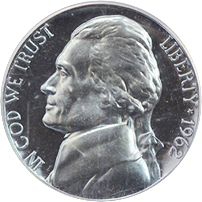 Acid or Restored Date - Used specifically in reference to Standing Liberty Quarters and/or Buffalo Nickels where the design of the coin leaves the date exposed to excessive wear. 'Acid' or restored date coins have had the date enhanced by acid or chemical alteration removing layers of the field to bring back the date. Troy Pound (LBT) vs Traditional Pound (LB) - While most people are more familiar with the traditional or common Pound (LB) unit of weight, precious metals and gemstones are generally designated in Troy Pounds. A Troy pound consists of 12 Troy ounces, whereas a traditional pound consists of 16 ounces. For comparison, a Troy pound consists of 373.24 grams, while a traditional pound is 453.59 grams.